Students gathered at the Student Union Assembly (SUA) Tuesday night meeting. Photo by Nikolasi Saafi. Reconvening at the Cervantes and Velasquez room above Quarry Plaza, Student Union Assembly (SUA) officials and UC Santa Cruz ethnic organization representatives met at SUA’s general meeting for the third week in a row. Two weeks after four of the Big Five ethnic organizations confronted SUA about its handling of its fall concert budget, attendees spent the evening of Nov. 13 analyzing proposals to reapportion funds for next year’s SUA budget. On Oct. 30, four of the Big Five ethnic organizations — the Black Student Union (BSU), Asian Pacific Islander Student Alliance (APISA), Bayanihan and Movimiento Estudiantil Chicanx de Aztlán (MEChA) — questioned SUA President Ayo Banjo and Vice President of Student Life Isabella Bullock for allocating $30,000 of general funds to the concert without following constitutional procedures. 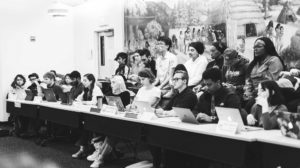 At the general meeting this Tuesday, Banjo addressed transparency and budget mismanagement concerns, focusing on his budget proposal for the 2019-20 year. “There are enough funds for SUA and ethnic identity orgs and for the rest of the organizations to apply [for funding] this year,” Banjo said at the SUA meeting. He declined to interview with City on a Hill Press. For over 35 minutes Banjo walked meeting attendees through the SUA budget and allowed them to ask clarifying questions about it. He proposed replenishing the spent general funds with money from various line items, including the Students of Color Conference, in the budget. Banjo has been SUA’s acting treasurer since Oct. 17, when SUA’s hired treasurer for the academic year resigned. Banjo didn’t discuss reasoning behind his proposed reallocation of the funds in depth, though he offered to speak with students after the meeting to answer possible questions. Banjo said his budget revision would increase general funds from $17,000 to $24,000. In a Nov. 9 email to the student body, Banjo estimated “a total of $100,000 available for UCSC campus organization to apply for programming support,” including “plans to create scholarship funds” under his proposed budget. His budget awaits SUA approval and will be discussed in upcoming general meetings. At the Nov. 13 meeting, SUA officials also proposed ways to improve transparency and accountability. College representatives Stephan Edgar and Emma Cunningham were in favor of re-establishing SUA’s Vision Committee. The Vision Committee worked to improve and define SUA’s bylaws and Constitution last year. Ethnic organizations’ tones shifted since the Oct. 30 meeting, when they rallied against SUA’s misuse of funds. At the Nov. 6 meeting, they emphasized their desire for group accountability and progress rather than placing blame on Banjo and Bullock. “We’re disappointed in the officers and representatives that sat back and that basically watched him [Banjo] get torn apart and didn’t step up and take any accountability,” said Colby Riley, vice president of BSU at the Nov. 6 meeting. Riley emphasized BSU is not blaming SUA representatives. The meeting moved the budget discussion from a focus on officer culpability to moving forward. Some SUA representatives voiced concerns about this shift. The Nov. 6 meeting saw a shift from calls for impeachment toward focusing on progress, improving SUA and eliminating “toxicity,” a term the SUA body and ethnic organizations used to describe divisiveness and hostility within SUA spaces. “The comments that were said by the Big Five orgs were comments that I heard. I said ‘OK,’ and I digested and I continued. […] And now I’m going to do everything in my power to make it right,” Banjo said at the meeting. In continuing his discussion on accountability, Banjo urged SUA representatives examine their role in the controversy and do the same. Four of the five ethnic organizations are working on demands to present to SUA. Their main concern is reforming the space into a more representative and inclusive space for all organization members and students, Anderson said. They plan on meeting with SUA officers once they solidify their demands.